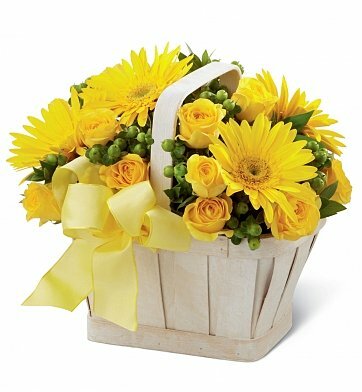 Gerbera daisies and yellow roses bring an uplifting presence to any room. Arranged in keepsake basket with hypericum berries and myrtle greens, this bouquet is the perfect way to welcome spring. Arrives in a keepsake basket. Measures approximately 10" x 10". Uplifting Moments is a hand delivered gift. These gifts are delivered by one of our local design centers located throughout the United States and Canada. Same day delivery is available for most gifts when ordered before the cutoff time. The cutoff time for Uplifting Moments is 2 PM in the recipient's time zone. My uncle who is 89 recently fell and broke his hip. He is in rehab and not that happy but did tell me that he is enjoying the flowers. They were a bright spot in his room. Thank you very much for doing such a good job with the arrangement.